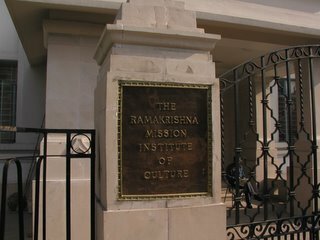 I’m sitting in the Ramakrishna Mission Institute of Culture International guest and Scholar’s house in Calcutta India. It is Saturday December 10th at 7:15 a.m. and I am sipping tea that was just brought to me. This room is clean, supplied with all the essentials, and on the first floor, (I almost got put on the 4th at sign in). It sort of reminds me of a dorm room, with the exception of a private bathroom. The noise from the traffic outside is loud, but relatively calm at this early hour. This is not a hotel, but rather an educational institution, (which technically makes this a dorm I suppose). They teach English, Sanskrit, and a few other courses. You must apply to stay, and be recommended by someone. They serve 3 meals a day in a dining room and tea two times a day right to your bedroom, all for Rs 410/night, (about $10). I am relieved that the lodging situation is a good one, and I look forward to having this as my home base. 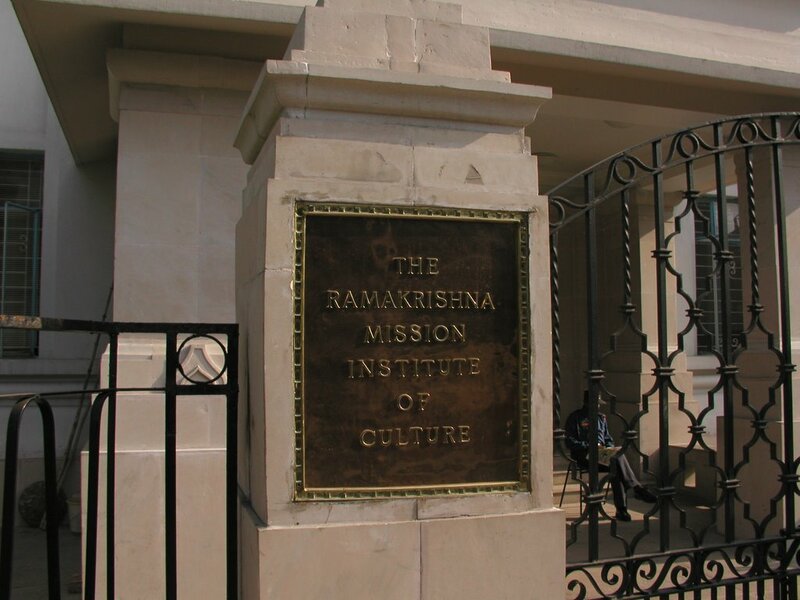 I was brought here by my guruji Pt. 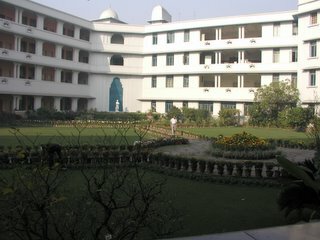 Samar Saha. He is a world renound tabla maestro who does a big world tour once a year and always stays for a week or two near my home in Michigan. I met him in 2003 through Dr. Rajan Sachdeva, the director of the Institute of Indian Classical Music in West Bloomfield, MI. He told me that Samar Saha was coming to town and he wants to teach some lessons. I went with some other students to take the lessons and we hit it off right away. I loved his teaching style, his playing style, and his eagerness to teach students in the midst of a long tour. On our second day of lessons he gave me the news that the sitar player he was supposed to accompany in the next evenings concert in Ann Arbor has cancelled due to severe illness. He then told me and one other student that we will go on stage with him and play the concert. My belly turned to jelly and we spent the next 5 hours putting together a tabla piece. It was my first major public performance on the tabla, and I could not have been more nervous. I made more mistakes, missed more cues, and used more powder (to keep dry hands) than I would ever imagine doing in a big show, but when it was over, I felt like the world was at my feet. I was so honored and humbled by the performance. I instantly felt like my tabla playing became a real thing and not just something I studied at school. To this day, I am not 100% sure why Samar Saha asked me to play with him, but I will forever be grateful for the opportunity. He is the reason I am sitting in Calcutta today. In 1993, Samar Saha’s guruji, Pt. Krishna Kumar Ganguly passed away. 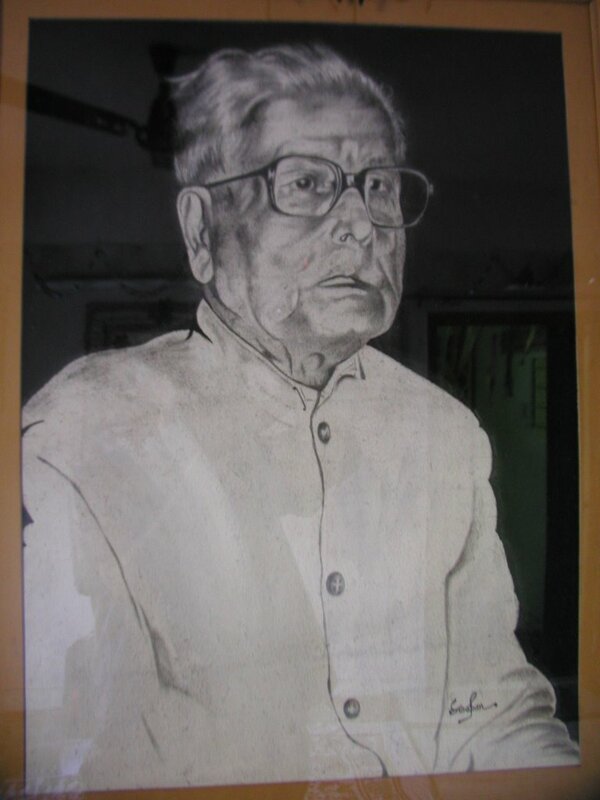 It was that year that Saha started Sangeet Pyasi organization in honor of his late teacher. Today the organization is gearing up for what is being billed as the biggest tabla and Indian classical music mega festival of the decade. I will be sitting in the front row for the whole thing. I am not sure what to expect, aside from the amazing performances, (11 tabla solos in all, plus many other instrumentalists). So far, in my short time here I have been sitting on the ‘tabla flat’ listening to Samarji and his students prepare for the opening night, which is just one day away. The tabla flat is a little building right down the road from Samarji’s home. The first floor is a tabla shop where they spend all day making tabla. The second floor is a nice little 3-bedroom apartment, which, on most days is where Samarji teaches. Today, and for the last 2 months, it is central headquarters for the festival organization. Last night, as I fought jet lag and two sleepless days of travel, I sat in the main room playing tabla. Students would come out of the back room and play with me and ask questions in broken English. It is so exciting to see Samarji’s students. They are really good players and have the same gentle demeanor of their guruji. I am very excited to get to know them more and learn from them.